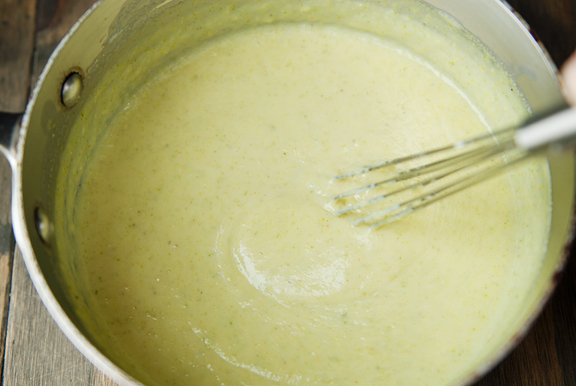 The pistachio pudding can be made up to 3 days ahead. Of course, the shortcut would be to use instant pistachio pudding mix, but it tastes so artificial compared to this pudding. So if you are making this for a special occasion, do the real deal – at least once. It’s delightfully good. 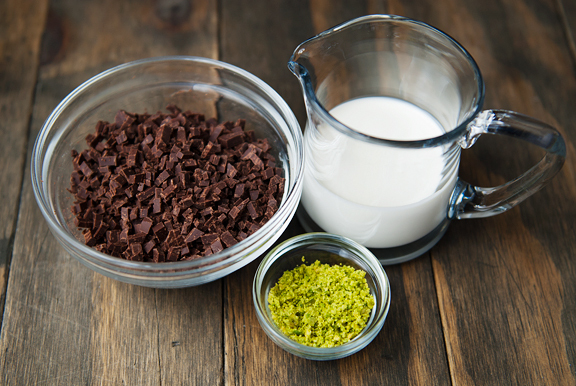 When the paste is ready, you can begin making the pudding. I found the pudding to be a decent consistency for pudding, but not thick enough to hold up in a cream puff. 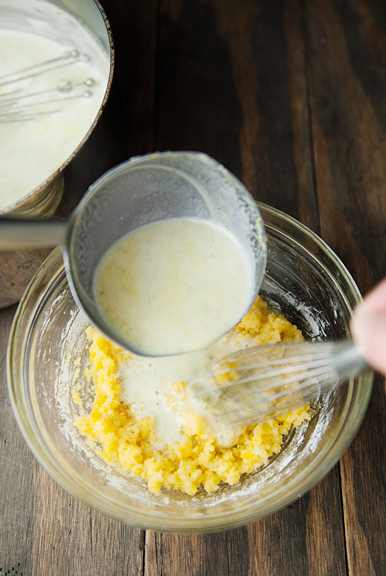 So even though the photos show two egg yolks and two tablespoons of cornstarch, I doubled both of those components in the recipe below to help make a thicker pudding. I’m of the opinion that the puffs are best eaten the day they are made. They tend to lose their crisp exterior after a day or so, but I have read that the choux pastry dough can be refrigerated for a couple of days until ready to use. I haven’t tested this myself, so please test it once before you try a new recipe for a wedding reception or something important. I don’t have a shortcut for cream puffs because they’re pretty straightforward. You can do this, easy peasy. If piping your dough, try to pipe straight up rather than at an angle. The puffs tend to expand in the direction they are piped and a straight up piping will give a symmetric puff. When done, the outsides should be crisp and the insides hollow and soft. I baked mine pretty golden because I have a thing about undercooked pastries. People are so fearful of a good deep bake, but that browning means flavor and texture! So don’t burn them, but don’t allow them to bake to a mere pale yellow. The rest of the steps should be done right before you are ready to assemble. You don’t have to glaze the puffs at all, but I couldn’t figure out any other way to make the crushed pistachios stick to the top. Besides, dark chocolate and pistachios are a match made in heaven. For real. I’m not even a huge fan of chocolate, but I love it with pistachios. Next, slice all of the puffs in half horizontally. This works best with a serrated knife. 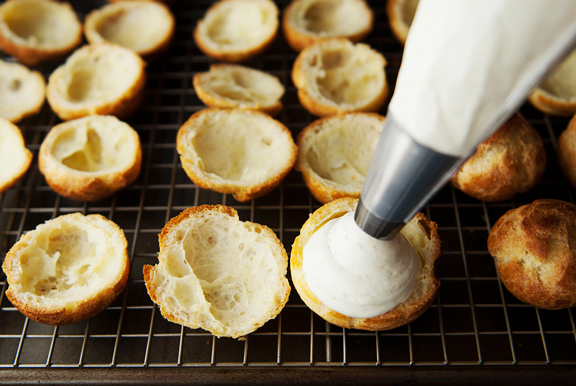 When the puffs are ready to be filled, whip a cup of heavy cream to stiff peaks. It’s okay to err on the side of slightly over-whipped because you are going to fold it into the pudding. This makes for a lighter filling while strengthening the structure, although you are welcome to fill the puffs with straight pudding if you like. Just check to see how well the pudding can hold its shape. If the filling is still too runny, whip the second cup of cream to stiff peaks (or slightly over-whip) and fold it into the pudding. Fill a puff base with pistachio filling, then dip its top half into the chocolate glaze (upside down). 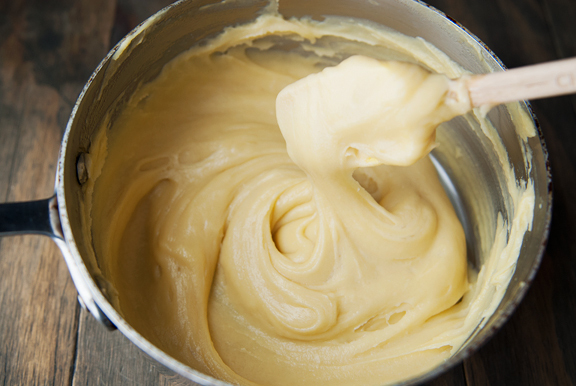 If your glaze has cooled, then give it a quick zap in the microwave for 5 seconds and stir it until it is smooth. Set the top back on the filling and sprinkle some crushed pistachios on top. Repeat until you have an army of deliciousness. 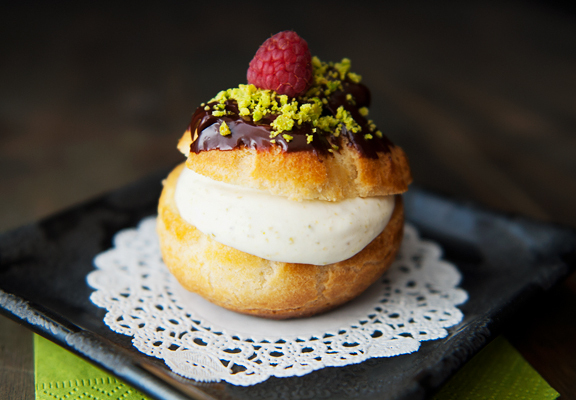 What you get are adorable two-bite cream puffs with a wonderful pistachio flavor. The combination of eggy pastry, creamy nutty filling, and a hint of bittersweet chocolate is decadence in a tiny edible package. Peel the pistachios (optional): Bring a quart of water to a boil in a saucepan. Meanwhile, fill a medium bowl 2/3 full of ice water. Add the pistachios to the boiling water and let boil for a minute. Drain the pistachios and place them in the ice water until the nuts are completely chilled. Strain the pistachios and spread them on a kitchen towel or layered paper towels. The skins should lift off, but this is a tedious task and takes some time. Crush or chop 1/4 cup of the peeled pistachios. Set aside. 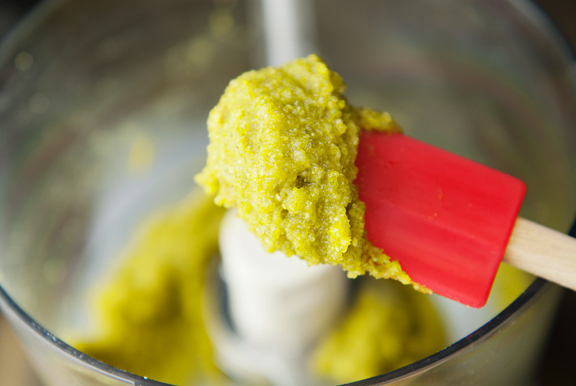 Make the pudding: Place 1/2 cup of the pistachios in a food processor and blitz them until they resemble coarse sand. 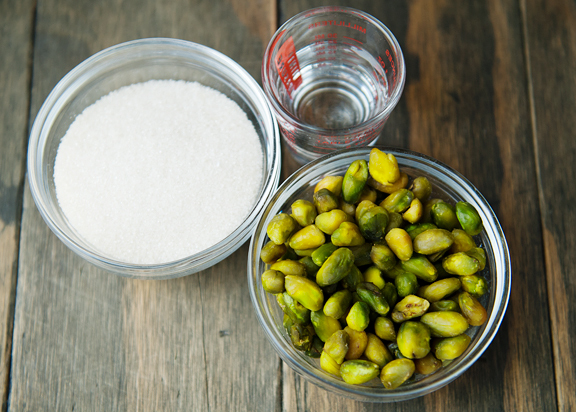 Add 1/2 cup of sugar and the water to the pistachios and blend until it forms a paste. 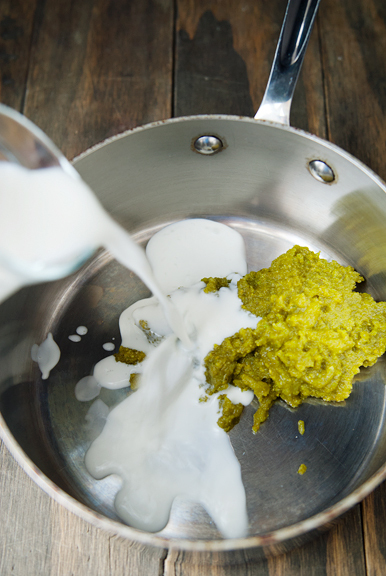 In a medium saucepan, combine the milk and the pistachio paste. 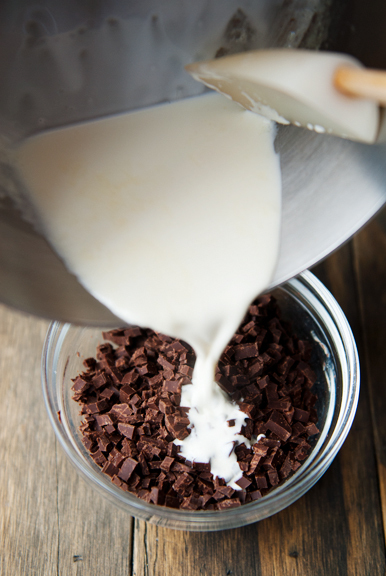 Whisk the contents together over medium heat until the milk begins to steam. Turn off the heat. 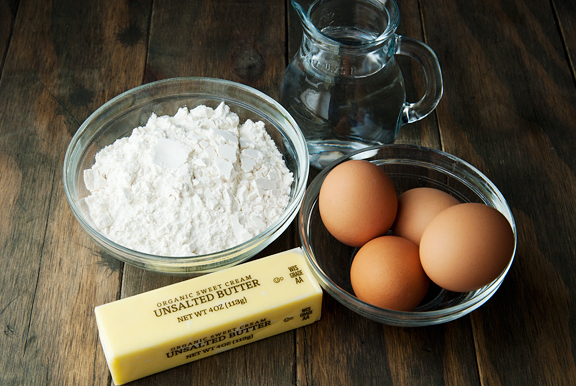 In a medium bowl, whisk the egg yolks, 1/3 cup sugar, cornstarch, and salt together until smooth and thick. 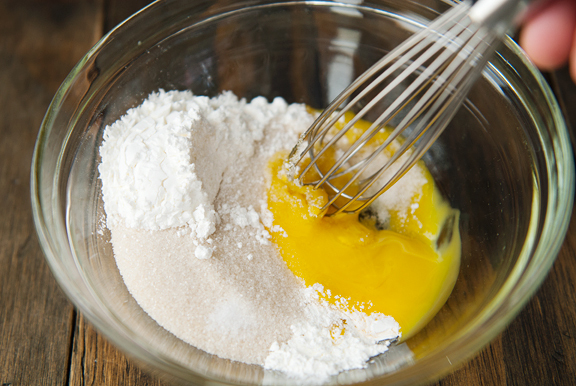 Whisk 1/2 cup of the hot milk into the egg mixture until combined. Repeat with another 1/2 cup of the hot milk. 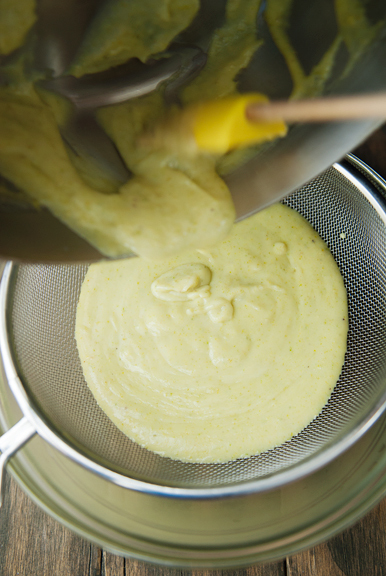 Pour the egg mixture into the saucepan with the rest of the milk and whisk constantly over medium heat until the custard thickens. Let the pudding boil for 1 minute while whisking vigorously. Remove from heat and strain the pudding through a sieve. Stir in the vanilla and almond extracts, and the butter. Cover the pudding with plastic wrap and refrigerate for at least 4 hours. Can be made up to 3 days ahead. 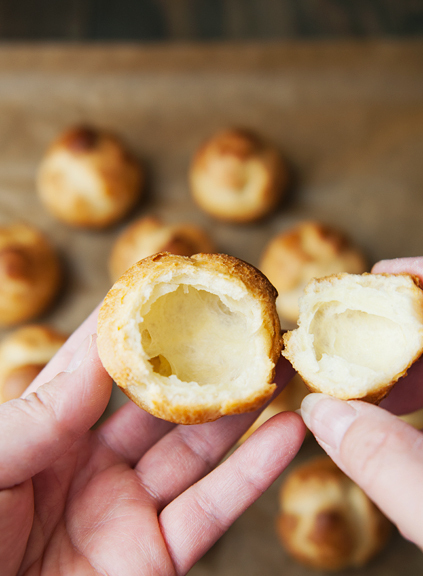 Make the puffs: Preheat oven to 400°F. Line a rimmed baking sheet with parchment paper. 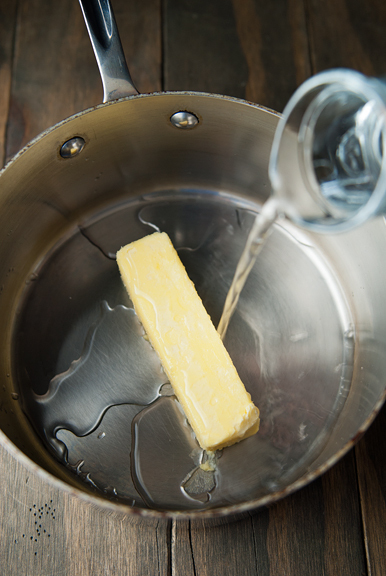 Bring 1 cup of water and the butter to a boil in a medium saucepan over high heat. 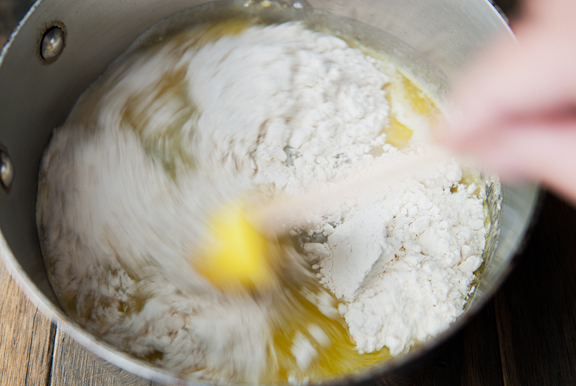 Turn off the heat and stir all of the flour in at once until completely incorporated. Return the pan to the stove over medium heat and stir the dough to help it dry out for a minute or two. Remove the pan from the stove. 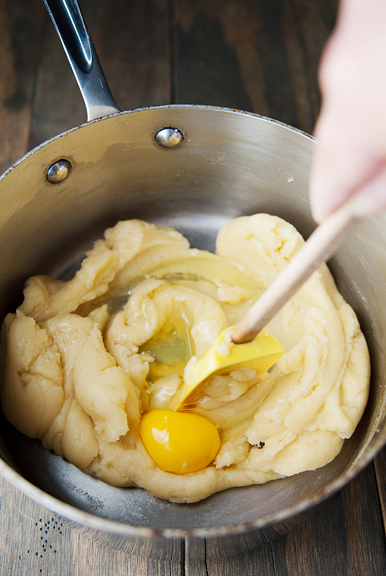 Stir the eggs in one at a time, mixing well until the egg is incorporated into the dough before adding the next one. 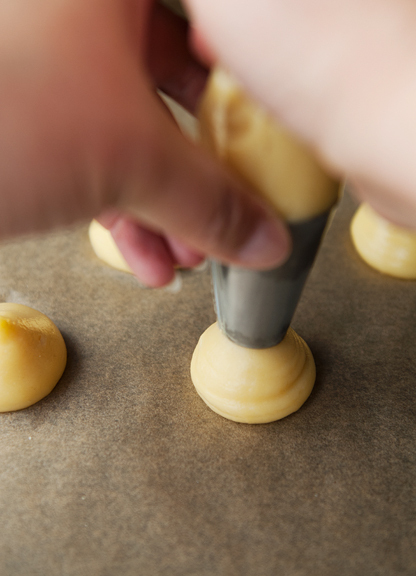 Drop tablespoon dollops or pipe tablespoon mounds of dough onto the baking sheet about 1-2 inches apart (more distance for larger puffs). 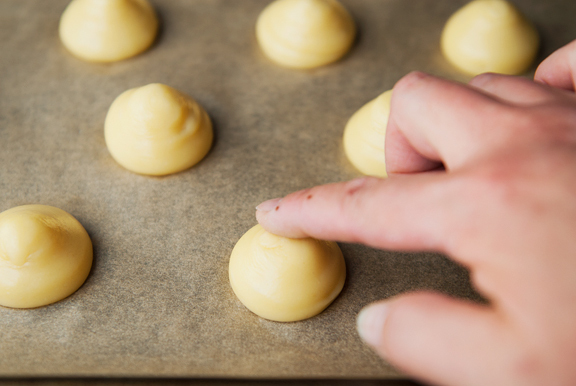 Dip your finger in water and smooth the tops if there are any points of dough poking up. Bake for 30 minutes until golden in color and hollow sounding when tapped on the tops. Turn off the oven and crack the door ajar (or use the handle of a wooden spoon to keep the door cracked). Let the puffs remain in the oven for an additional 15 minutes. Remove and cool completely. 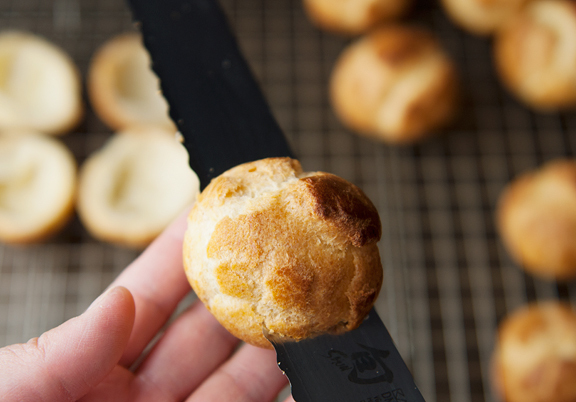 Using a serrated knife, slice the puffs in half horizontally (top and bottom halves). 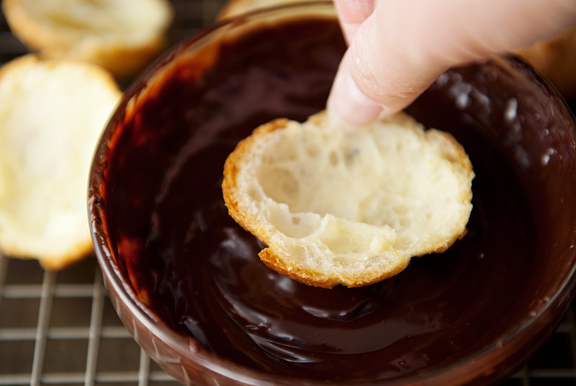 Make the glaze: Place the chocolate in a small bowl. Heat the heavy cream in a pan until just bubbling at the edges. Pour the cream over the chocolate and let sit for a minute. 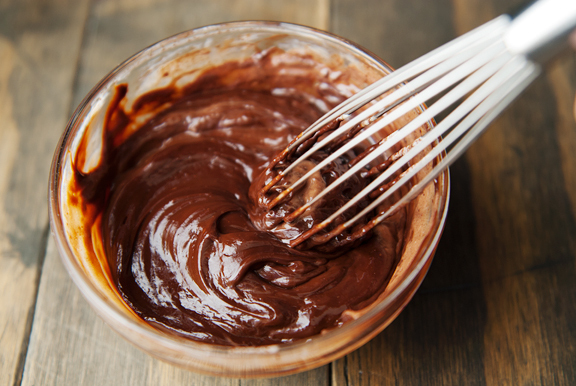 Stir the cream and chocolate together until it forms a glossy, glaze. 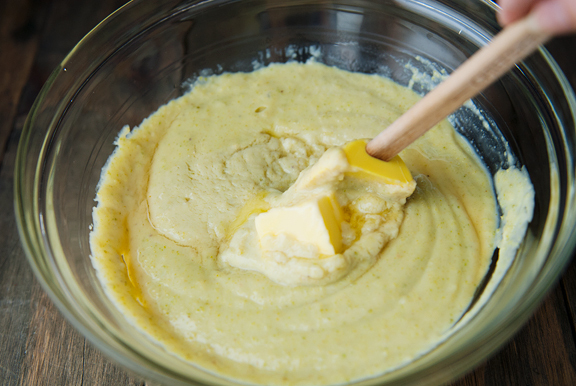 If it hardens too much for dipping, you can pop it into the microwave for 5 or so seconds, then stir until smooth. 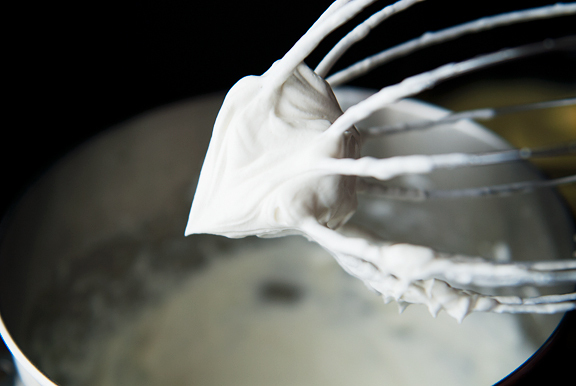 Make the filling: Whisk 1 cup of the heavy cream to very stiff peaks. 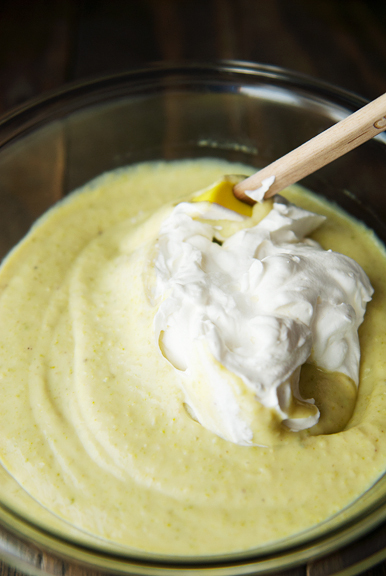 Fold the whipped cream into the chilled pistachio pudding. If the filling is too runny, whip the second cup of heavy cream to very stiff peaks and fold it into the pistachio pudding. It should hold its shape when piped or spooned into a cream puff base. 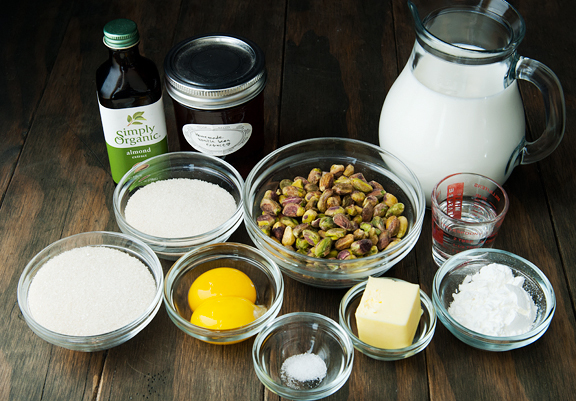 Assembly: Fill a cream puff base with about 3 tablespoons of pistachio filling. 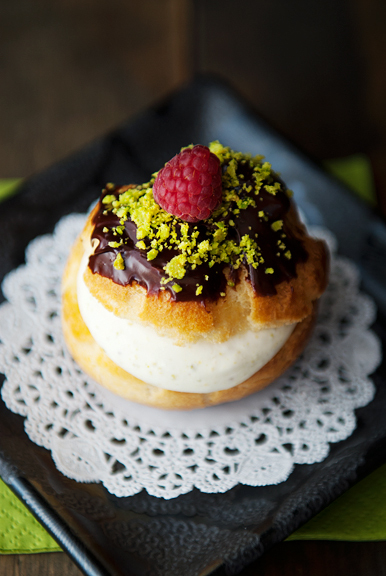 Dip the top of the cream puff top into the dark chocolate glaze and set it on the pistachio filling. 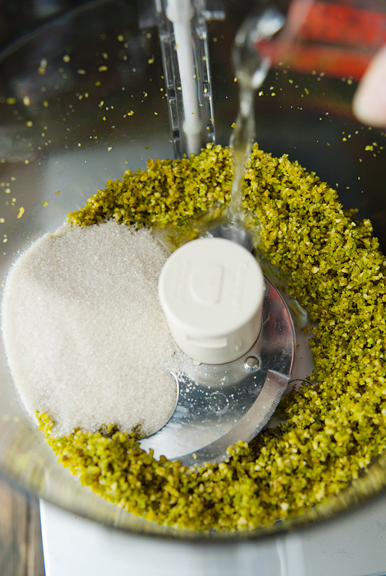 Sprinkle crushed pistachio on top. Repeat for the remaining puffs. Makes about 36. Those look seriously delicious. I wish I wasn’t drowning in cookies, with more to make! These will have to wait, but I am sure they will be worth it. Love these! I’m grateful you are so clear in your explanations and photos – your clarity gives me the courage to try things I never would otherwise… like cream puffs! Can’t wait to give these a go. Thank you, Jen! Thanks so much for the cream puff recipe! Those look delicious! This is a high altitude recipe already, right? No adjustments needed for 8600 feet? What a beautiful greeting card, the pictures are magnificent! Wishing you, Jeremy & Neva a lovely (snowy) Holiday, and a Happy New Year! Thanks for being a happy part of my day! Happy New Year to you, Jeremy & Neva! Looks awesome! 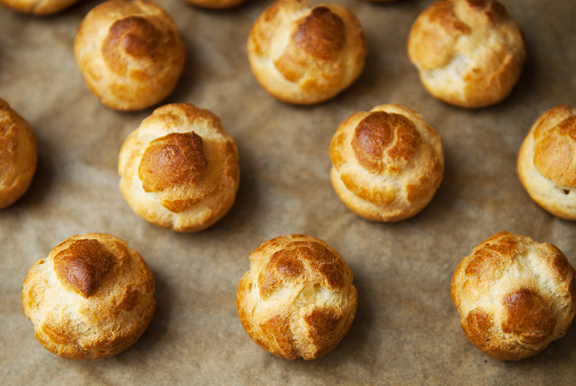 I was planning to make gougeres for Christmas, but might have just changed my mind… I’ve succesfully kept puff pastry in the fridge, inside a piping bag so it doesn’t form a crust, for a couple of days. Just bring it to room temperature before piping and baking. Happy Christmas! Valarie – the recipe works at sea level and high altitude. This kind of dough is nice like that! 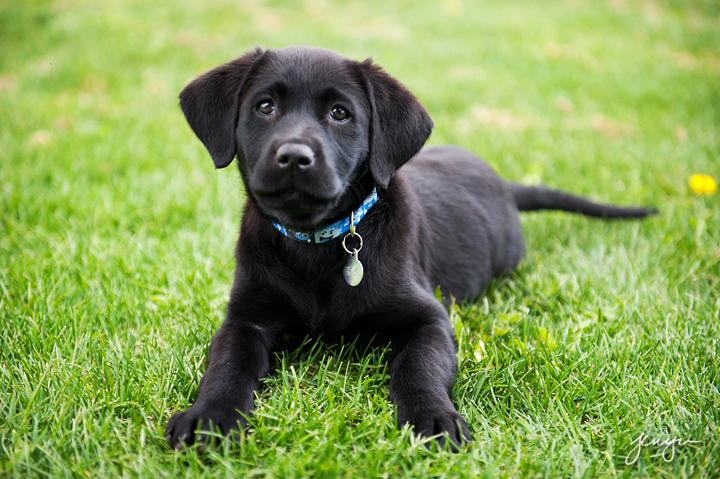 Marcia – aww, you are so very sweet. Thanks and happy new year! Nekkutyttoe – nice tip! I should remember that. Happy new year!